Jitbit HelpDesk is a comprehensive help desk ticketing system trusted by freelancers, small businesses, startups, and large enterprises. Designed for deployment via cloud hosting and self-hosting, this tool enables users to manage and track incoming support request emails as well as their associated tickets. It leverages machine learning to automate tasks and allow you to focus more on customer service operations instead of tedious back-office tasks. Additionally, this software focuses on UI simplicity. It is not bloated with features that are unessential to customer support so you can expect a no-fuss user experience the moment you implement it. The platform even has short and efficient administrator pages that make it quick to navigate. You can even fully customize the entire look of the software by supplying your own CSS styles or adjusting the color scheme according to your branding. Unlike traditional help desk platforms, JitBit HelpDesk has a powerful REST API that lets it integrate with dozens of external applications. It can work seamlessly with your company’s existing software, email, and Active Directory. Moreover, to make things more convenient for you, the platform supports single sign-on features that let you connect the app to different authentication systems. With this at your disposal, you can get a detailed overview of your tickets and customers. Your business can then organize tickets by allocating tags and categories and view specific tickets through filters. In addition, you can also use filters to apply certain actions, route tickets, and set priorities. You can likewise use tickets to establish a knowledge base and look at your company’s business performance. What’s more is that JitBit HelpDesk is a relatively affordable support solution compared to its competitors. For one, they don’t price their plans per agent and they offer monthly and annual pricing options. All of their contracts also include free upgrades within a year as well as discounted upgrades afterward. JitBit HelpDesk is simple and uncluttered, making it easy for agents and end-users to utilize. From managing email tickets to accessing the self-service portal, this software is a breeze to use. JitBit also has a fast and intuitive visual UI that makes administrator pages short and efficient, therefore, faster to navigate. To make further simplify your help desk efforts, the software also supports a single sign-on feature that lets you connect it to your local Windows authentication system, Google accounts, or any other external authentication provider. Optimize the way you handle customer service requests using JitBit’s machine learning-powered automation. This feature enables the application to quickly suggest relevant FAQ articles to agents so that they can accommodate your clients’ needs better. It also allows you to create rule-based chatbots and auto-responders so that you can respond to common scenarios much faster without wasting manpower. JitBit HelpDesk has a ticket grid view showing the status of all your new and ongoing tickets. The grid can also use filters in order for your business to customize your view of the tickets coming in. You can likewise group and merge tickets, categorize customer tickets, as well as assign tickets to your company’s specific team members. It even allows you to track support tickets and manage contacts by integrating with your company’s email and Active Directory. The tool’s reporting tool also makes it easy for you to keep a critical eye on your team performance. Jitbit offers a set of built-in analytical reports that will give your business insights about various issues and a customized report feature that allows you to build your own reports quickly. Jitbit Helpdesk integrates with dozens of external apps. Be it project management systems, CRM tools, bug-trackers, or other software solutions, this platform can support it to cater to your operational needs. Furthermore, JitBit has a powerful REST API that lets you can connect it to any other business systems you have in place. Other than giving you a self-hosted option so you can implement the application on your own servers, JitBit also offers a wide variety of customization options to help you apply your branding to the platform. You can choose to add your logo, change the colors of the interface, as well as supply your own CSS to fully configure the look of the platform. 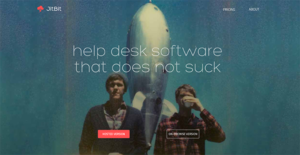 What Problems Will JitBit HelpDesk Solve? Having a shared inbox for customer support can help you and your team members get a more transparent view of your pending service requests. However, this can lead to confusions as to who is answering each email. Moreover, traditional inboxes can get cluttered, making it difficult to track previous conversations. With JitBit Helpdesk, you can easily track who is working on what service request. Moreover, the application can detect if a sender has contacted you before and automatically give you the details of the sender’s previous transactions with your company. This way, you can pick up where your conversation left whenever they contact you. All of your agents want to respond to each ticket as quickly as possible. Because of this, your agents can unknowingly work on the same service request at the same time which can lead to confusion on the part of the client. To avoid these user collisions, JitBit HelpDesk allows you to get real-time updates on tickets. This way, you can check if a support representative is already helping out a client. Understanding the performance of your operations is key to improving customer service. Using JitBit HelpDesk, you can get access to tools that will help you analyze your team’s efficiency. It has built-in reports that will let you pinpoint your first response times, check the busiest time of a particular month, as well as determine your most active customers. There are also great time-tracking options for easier customer billing. Moreover, JitBit comes with a custom report builder that lets you customize what data to aggregate and how to display them. Every enterprise has its own characteristics, and may need a special Customer Service Software solution that will be fit for their company size, type of clients and staff and even individual industry they support. We advise you don't count on locating a perfect services that will be suitable for every business no matter what their background is. It may be a good idea to read a few JitBit HelpDesk reviews first and even then you should remember what the solution is intended to do for your company and your employees. Do you need an easy and intuitive service with only elementary features? Will you actually use the complex tools needed by pros and large enterprises? Are there any particular tools that are especially beneficial for the industry you work in? If you ask yourself these questions it will be much easier to find a solid software that will fit your budget. How Much Does JitBit HelpDesk Cost? JitBit offers different pricing plans depending on your deployment preferences. These are all inclusive of 24/7 support, instant delivery, and free upgrades. We realize that when you make a decision to buy Help Desk Software it’s important not only to see how experts evaluate it in their reviews, but also to find out if the real people and companies that buy it are actually satisfied with the product. That’s why we’ve created our behavior-based Customer Satisfaction Algorithm™ that gathers customer reviews, comments and JitBit HelpDesk reviews across a wide range of social media sites. The data is then presented in an easy to digest form showing how many people had positive and negative experience with JitBit HelpDesk. With that information at hand you should be equipped to make an informed buying decision that you won’t regret. A ticketing system that functions great and is user-friendly. It's not a bad app to begin with. Customer management support has been easy since using this. Crispy clean UI. Users are loving this thing. What are JitBit HelpDesk pricing details? What integrations are available for JitBit HelpDesk? Pros: It doesn't come bloated with a bunch of useless stuff. It's unlike other systems that try to have "something for everyone." As a help desk, it's pretty robust. It even comes with a self-hosted version of its own. Cons: Its asset-management module appears to only limit itself to its basic functionality. Nevertheless, it does what it's supposed to do. Unfortunately, it has integration with Twitter. User forums are absent. Pros: Great web UI. Fantastic e-mail integration. I love how you can build or come up with a reply to tickets through e-mail. Those are my favorite functionality. Cons: Software is lacking the functionality in getting a user to log out. Being an admin, we're hiring regular users to work wih tickets. At the same time, we also have an admin user to look into admin-only tasks. At this point, there's no other way to toggle between the tow without removing cookies, going all incognito, or accessing through a different browser. Great web UI. Fantastic e-mail integration. I love how you can build or come up with a reply to tickets through e-mail. Those are my favorite functionality. Thanks for the review! Just wanted to point out there's a tiny "sign out" button in the top-right corner. Perhaps we should make it more visible ;) Thanks again! Finally, a solution for handling tickets. Handling it is simple. It does well in integrating with mos software. Never encountered a learning curve. Great for customer service. Users love its squeaky clean interface. If you need more information about JitBit HelpDesk or you simply have a question let us know what you need and we’ll forward your request directly to the vendor.